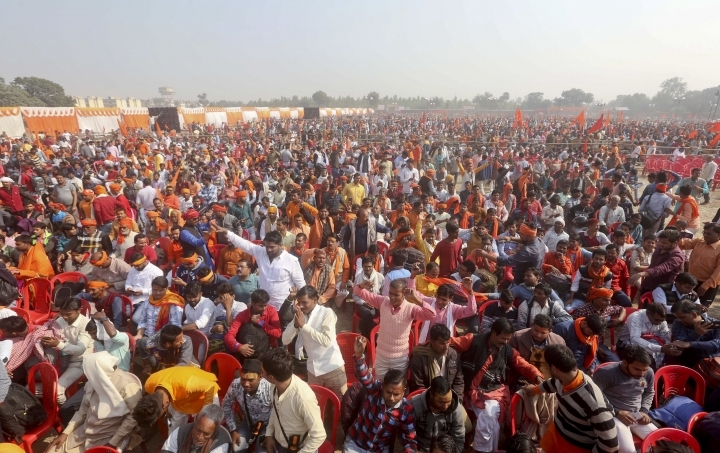 LUCKNOW, India — Tens of thousands of hard-line Hindus rallied Sunday to demand a Hindu temple be built on a site in northern India where hard-liners in 1992 had attacked and demolished a 16th century mosque, sparking deadly Hindu-Muslim violence. The Hindu hard-liners are building pressure on Prime Minister Narendra Modi's government to move quickly on the issue. Modi had promised to build the temple in 2014 elections that brought him to power. The next national elections are due before May. 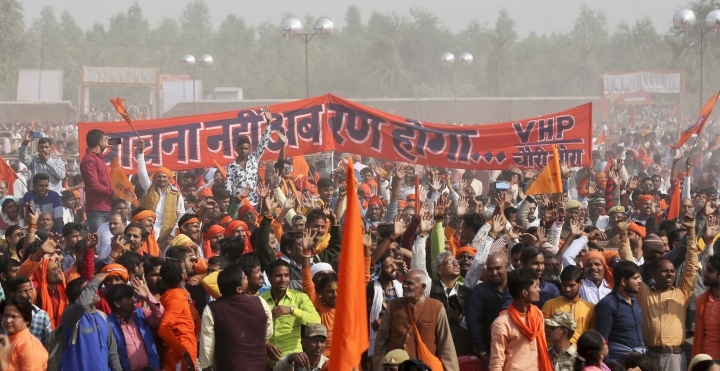 Thousands of police and paramilitary forces were deployed in and around Ayodhya, 550 kilometers (350 miles) east of New Delhi, to prevent any attacks on Muslims, who comprise 6 percent of the town's more than 55,500 people. The rally brought Hindu holy men and activists to the town where the Hindu god Ram was believed to have been born. The demonstrators chanted slogans demanding the building of the temple and waved a banner that said, "No more requests, now it will be battle." "Hindus have waited for a long time. They are losing patience," Mahant Nritya Gopal Das, who heads the committee on the disputed land, told the crowd. "The time has come for the government to take a call." 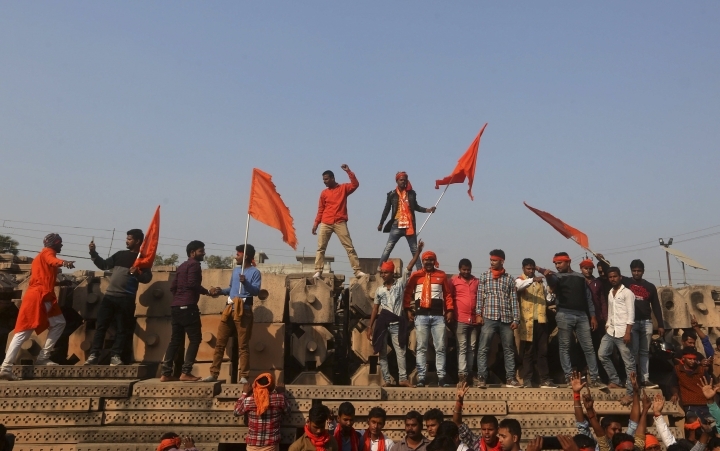 The ruling Bharatiya Janata Party's ally in the federal government, the Shiv Sena party, asked Modi's government to bring legislation to build the temple, as India's top court is taking time to settle a land title dispute between Hindus and Muslims. Shiv Sena's chief, Uddav Thackeray, said if construction of the temple does not start, Modi's government would not return to power. "The prime minister has to choose between the temple and the government," he told reporters. Hindu fundamentalists with pickaxes and crowbars razed the 16th century Babri Mosque to the ground in December 1992. The destruction of the mosque sparked riots across India that left at least 2,000 people dead. Thousands more died in later violence caused by disputes over the site. The issue was also taken to court. A lower court in 2010 ruled that the disputed land should be divided into three parts — two for the Hindus and one for the Muslims. The decision was challenged in the Supreme Court, but there has not been any decision yet.